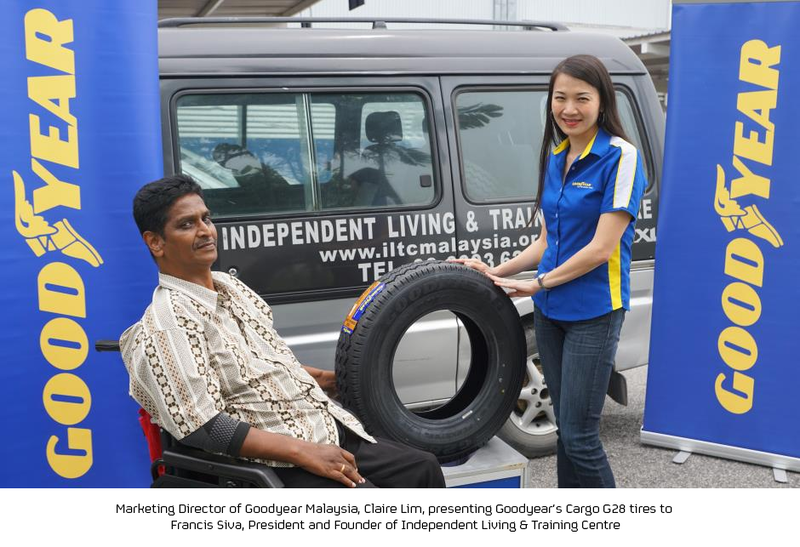 KUALA LUMPUR, 28th September 2015 – Goodyear Malaysia continues to show its commitment to supporting the community by supplying a set of its long lasting and durable Goodyear tires to the Independent Living & Training Centre (ILTC). ILTC is a non-profit, charitable organization that assists physically disabled people to develop their abilities and maximise their level of independence. The sponsorship consists of four Goodyear Cargo G28 tires that will be fitted to a Ford Spectron van, the organization uses to provide transportation assistance for the disabled. “One of Goodyear’s shared values is ‘caring for our communities.’ The company strives to build relationships with organizations and people that work to help improve and develop society,” said Claire Lim, marketing director of Goodyear Malaysia. Through Goodyear Malaysia’s community outreach program, the company has extended support to organizations with a focus on enhancing public safety, wellbeing and education. Organizations that have received support include St. John Ambulance, Spastic Children’s Association, the Malaysian Association for the Blind, the Independent Living and Training Centre, the National Kidney Foundation and Mercy Malaysia.